I was not happy with either the useless rear drum brakes or the mushy brake pedal feel using an S2-like master with the big Wilwood front calipers and no brake boosters. 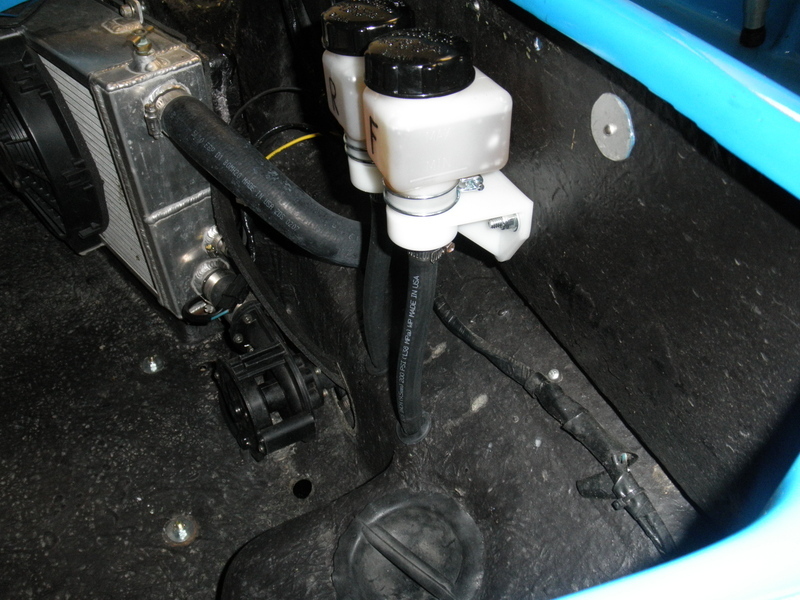 I have a revised system in place as of May 2011, the system installed and partly designed by Barry Spencer, Spencers Motorsports, Hayward, California. The front calipers are the same form factor as the Zender kit but the latest Wilwood and have four 1.75 inch pistons per caliper. The rear calipers have have four 1.38 inch pistons per caliper. As of this writing there is no brake proportioning valve (early indications are of good brake balance in the dry) but I will add such a valve if necessary. Lets start with the master cylinder, Wilwood's "Tandem Remote Master Cylinder 1.00" Bore Size". 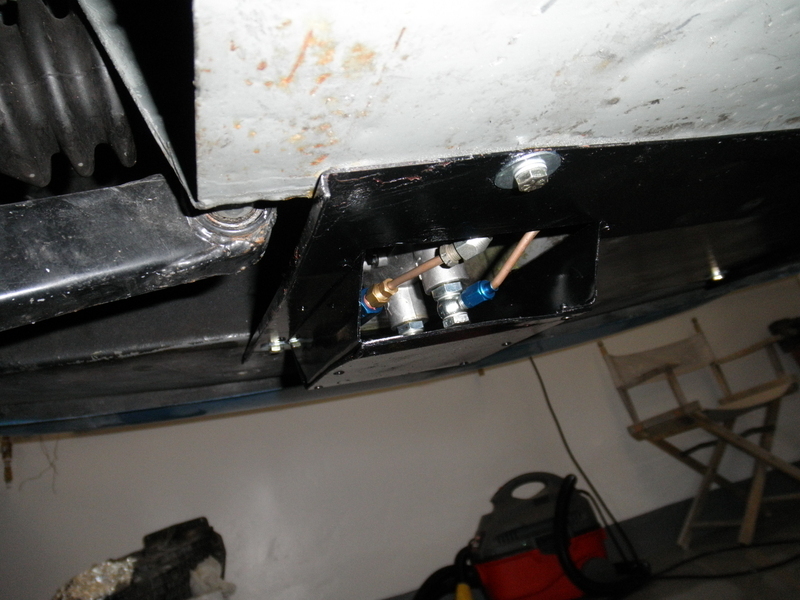 To get it to fit with its pressure outlets at the bottom it was necessary to push out the steel plate. This arrangement is not ideal, but it sticks down no further than the passenger compartment floor so is hopefully not too serious an aerodynamic problem. 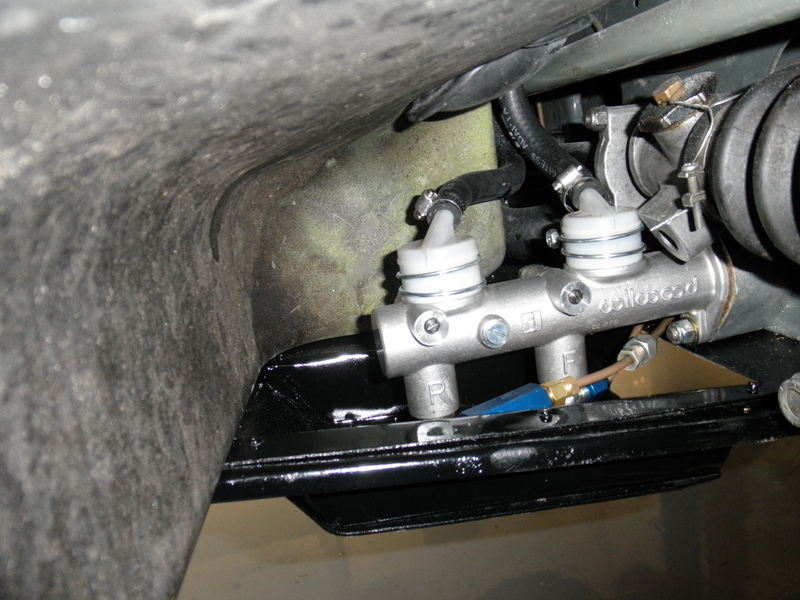 Because the rear brakes are above the disks (hence above the M/C), a "Wilwood in-line two pound residual pressure valve" was installed (that blue thing on each line at the M/C that shows in the pictures) so the height difference does not let the brake fluid pull the rear disk pistons back too much. I removed the residual pressure valves since the reservoirs are actually well above the calipers. Folks say to install them when the M/C is below the brakes...but those folks are assuming the reservoir is on the M/C! Not in this installation! While there was still some British brake rubber in the braking system I used exclusively GT-LMA brake fluid. Now that the last of the British brake rubber is out of the brake system I switched to AP 551 racing brake fluid, which has (as of 2018) been renamed AP Racing R1. Now the rear brakes themselves, first from the outside, then the inside. (The pictures show the older wheel studs, now replaced with longer ones, see the rear axle page for the new wheel studs). The following (from inside) is with the Legend rotors (the Legend rotors are no longer used). The rotors first used were 1989-90 Acura Legend solid rear rotors. They come plain or cross-drilled and/or slotted, the rotor thickness about 9 mm (but cross-drilled or slotted rear rotors this size seem impossible to actually buy). These weigh 9 pounds each. See Sierra Racing Brakes for the rotors now in use (much lighter). Do not buy vented rotors for this application, vented rotors are much thicker and much heavier. Napa 4886075 (1990 Acura Legend rear rotor) is a usable rotor, albeit neither cross drilled nor slotted. The Rockauto Centric 12140019 (121.40019) is identical to the Napa item (looks to be the same manufacturer, the machining marks look identical to Napa). Outside rotor diameter is about 10.25 inches. Total thickness 2.1 in, 53mm. Center through hole 5.525 in, 64mm. Center diameter where hub rests 5.35 in, 136mm. 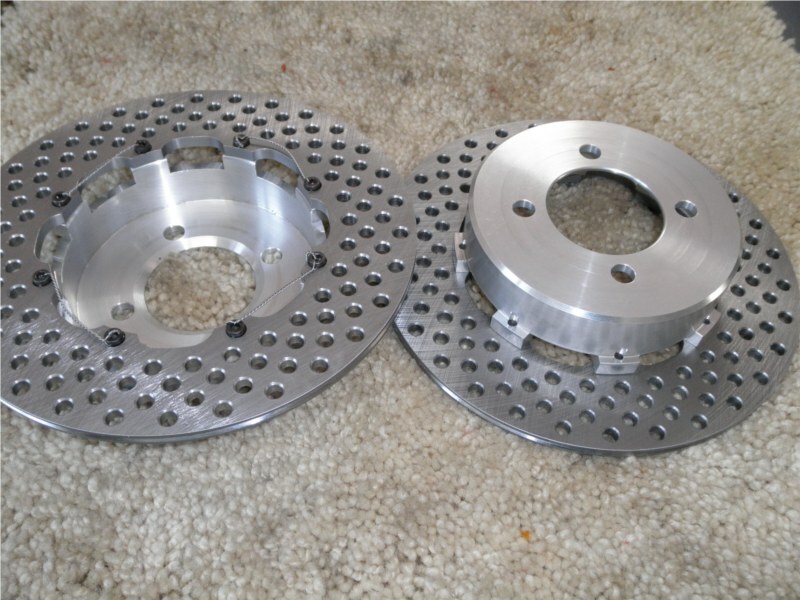 Inner and outer hat sides machined smooth. It may be that 2 door and 4 door Legends have different rear brake hats (meaning one is not as tall), but I am not certain. The existing 4 holes are on a 114.3 mm bolt circle, you have to create new holes on a 3.75 inch bolt circle for stock bolt-circle wheel studs. My local Napa store was able to source a pair of rotors within about 5 hours. The Rockauto.com rotor listings were very confusing, I do not recommend them as a source. The StreetBeatCustoms.com web site was poorly laid out (the page for the rear rotor showed two confusing descriptions of front rotors above the rear rotor -- the catalog seems a mess) and though the order and part number was for solid rotors they sent vented rotors. In the end my local Napa Autoparts store was the best resource. I looked for drilled or slotted rotors and Rockauto.com indicated there might be right-hand-only rotors (but in the end none were available). Slotted rotors are 'handed' (left or right) but when the Exige was new it used slotted rotors (the same on all 4 wheels) and a factory rep. told me they had tested and it made no difference whether the slots went forward or back, so using lefts (or rights) on both sides was fine (and factory delivered Exiges were that way for a while, but I do not know how long). So if you could find any appropriate slotted rotors you could use them even if sold as 'left only'. The spacers (1/4 inch thick aluminum) are to get the wheels to fit without touching the calipers. 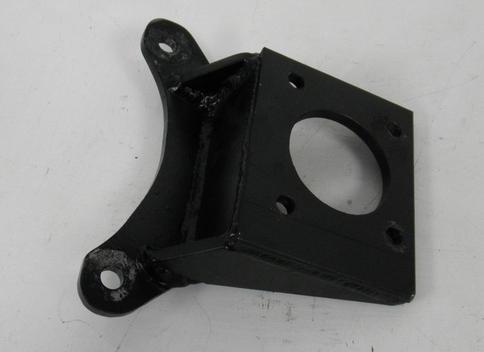 And here are a couple more detailed pix of the bracket (the brackets are handed left and right: each fits only one side, this is two views of the right-hand bracket). While the horizontal rear caliper position makes bleeding a bit more difficult, one simply has to remove the rear caliper mount bolt and loosen the front, then tilt the caliper to vertical before bleeding. The flexible lines to the caliper make this easy. I found SierraRacing.com (based in Carson City Nevada, USA) more or less by accident via googling, and though the catalog can be a bit confusing and not all in it is really available, I found Ron to be a good person to work with. Here is what the final rotor/hat setup looks like. Each hat/caliper weighs 5 pounds. Saving 4 pounds off of the 9 pound weight of each Acura hat/rotor! Ron can quickly draw and create custom hats. I started a drawing to get the numbers right, but quickly realized a simple spreadsheet was the key to get the hat-depth right so the rotor centered on the caliper. The key dimensions Ron needed were the wheel bolt circle and bolt diameter, the center clearance hole diameter, and what Sierra calls the "A dimension" of the hat (see the hat pages of the Sierra Racing catalog). In my case the "A dimension" is 1.485 inches. The hat/rotor/bolt setup costs around $1000 dollars for the pair, normally expressed as "1 Lotus Monetary Unit(LMU)". 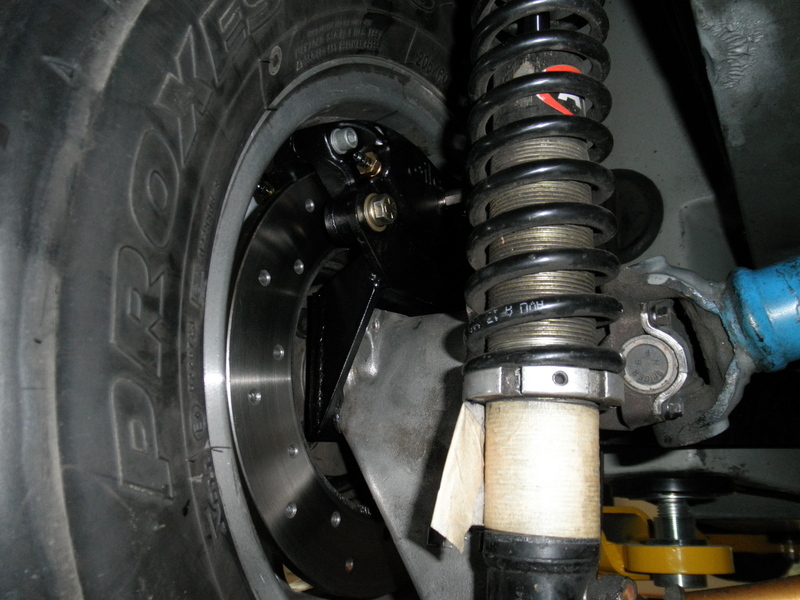 As of March 2012 the new rotors are installed and have been used at a track day. The part numbers are SierraRacing part numbers. Drilling the rotors with those 120 holes matters because it saves a pound of weight! Rotor: 003-0084Drilled Midget 8 bolt rotor, 10.25 in dia, 0.31 in thick.